Killer Characters: You think you know Hank Northcross? You think you know Hank Northcross? Well, guess again, because you really don’t know the first thing about me. That’s right. You heard me. I’m not sticking around. I’m gettin’ out of Dodge. I have to, because frankly, I just don’t trust myself. I’m a pretty calm guy, but there’s only so much I can take. Even somebody like me can be pushed to commit murder. And if there’s one bit of news that would give me an incentive, then this is it. You know, there are just times when your past catches up with you. You think you’ve put it all behind you, you’ve moved as far away from your old life as possible, and then . . . what happens? It all comes crashing back on you, that’s what. When I discovered the village of Snowflake years ago, I thought this place is perfect! No one will ever come looking for me here. This is last place any of my so-called old friends and associates would ever think to find me. Did I want to hide out? Sure did. I didn’t think of it as hiding. Escaping more like. Don’t get me wrong, it’s not like I ever committed a crime. I certainly never wronged anyone. I can't say the same about others though. In fact, I lived my life by the book. I was honest, hard working, did my best to help other people. I did everything right and what did I get? Nothing for my efforts, that’s for sure. Less than nothing. Punched in the stomach. Everything I wanted and everything I had worked for was taken away. I'm not whining, it's just the truth. I’ve been happy here. Really. I love the village. It’s peaceful – well, there are a number of murders – but it’s been peaceful for me. I’ve made some good friends and had a good life all these years. But now, I have to go. I don’t want to revisit my past. And I certainly don’t want my past to come looking for me. You can read all about it in A Clue in the Stew. That’s right, it’s coming soon. April 5th, in fact. I won’t be around, so you’ll have to make up your own mind about my story, because I really am gonna get outta Dodge. 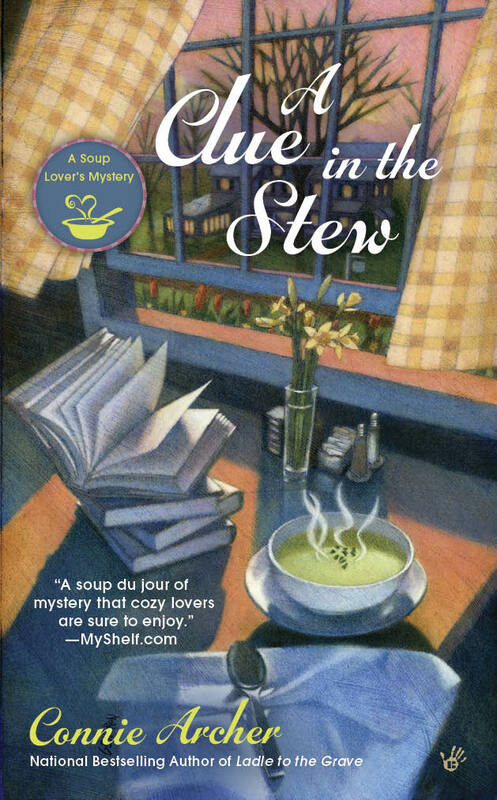 You can visit my author at her website to learn all about the Soup Lover's Mysteries. Or at Facebook.com/ConnieArcherMysteries and Twitter @SnowflakeVT. Happy reading! Ah, I hope you get to learn about Hank's secrets this April! Hi Sandy - Thanks for stopping by today! I hope you enjoy Clue! Coming soon! Oooh, what a teaser, can't wait to read this one! Hank, please tell your author hi ;-). Hi Sally - she says 'hi' back to you too! I'm not sure I like her to reveal all my secrets, but it's too late now. Oh thank you! So glad to hear. I really hope you enjoy Clue a lot! Thank you, Wilow! I will definitely need some luck! I've enjoyed all the stories in this series so far and I'm looking forward to reading about Hank's problems too. Hi Nora! Thanks so much! There's lots of gossip in Snowflake this time! Oh no, poor Hank. I can't wait to read this latest book in one of my favorite series. Hi Annette - thank you!!! Hank definitely has his problems this time around. Let's hope Lucky can help him! Thank you, Nicole, but it's not looking too good for me right now. I think it's best if I hide out. Maybe Lucky can find a solution! Ok, but I'm keeping my fingers crossed- lol! Well, that will be a very interesting story! Hi Elaine - I hope everyone likes this installment of the Snowflake stories! Thanks for stopping by today!